She's adorable, as is the scooter car in the background! Nice ride! I love when I can still see the OLD town in the new picture. Surprisingly, in this shot the town doesn't seem to have changed a great deal, except maybe cosmetically. The girl and the car really add to the interest of the postcard. 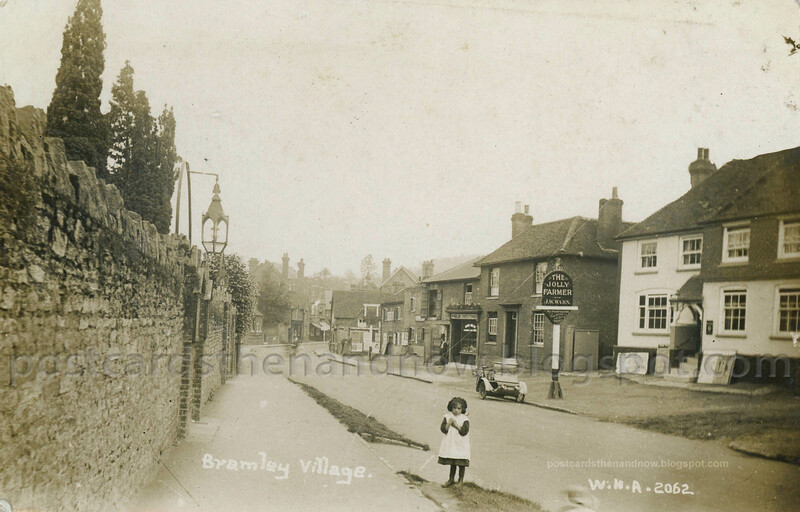 A nice trip to bramley. What a cute little girl. I wonder if she was posed or just happened upon the scene. This is one of the best cards I have seen of yours, Howard. The girl and the scooter make it; The Jolly Farmer may be in an urban setting now. Very nice! I find it interesting in the now and then pictures of how everything is the same (houses and the wall), but the perspective of the photos make such a difference. Of course, the Google one is viewing down from up high. She is a really cute little girl. You check the car out, I'll check the pub out. Great comparison, as usual. wonderful postcard, especially the section you zoomed in on. Nice to see that the road is still recognisable were someone from the past to visit. 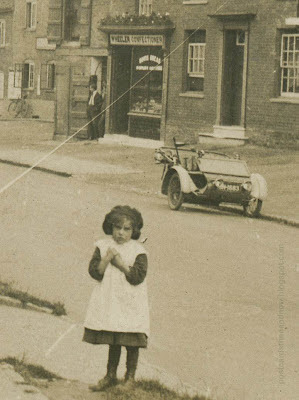 The girl would like us to buy her something at the confectionery. That car is amazing. Where's the rest of it? There are more ghosts in this one too. 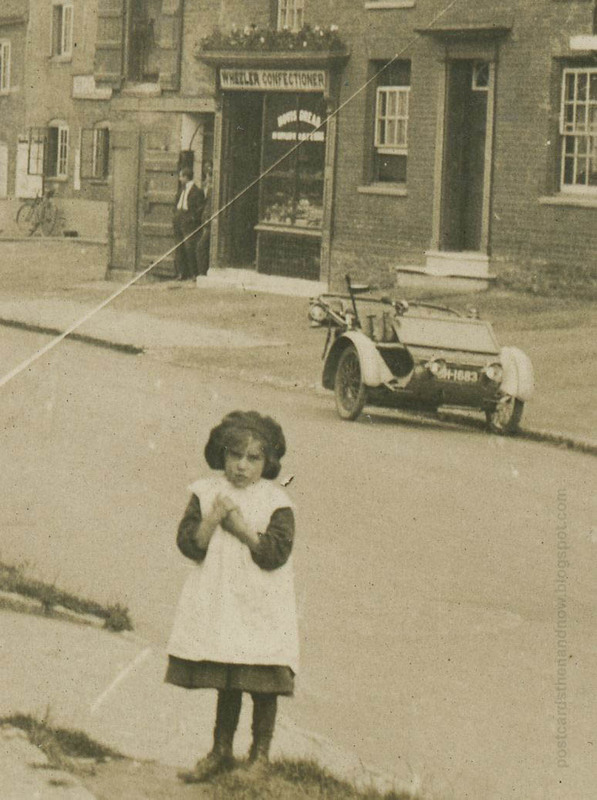 A wagon or motorcar is in the road and maybe another child under the W of the photographer's logo. Curious that he chose to focus on the pub and not the church. The current pub probably has far fewer farmers, jolly or not, than when this photo was made. Nice to see that the pub is still in business, though the modern scenes lacks the charm of the sepia one. The child in the foreground is delightful; you can see that she was really curious about the photographer.